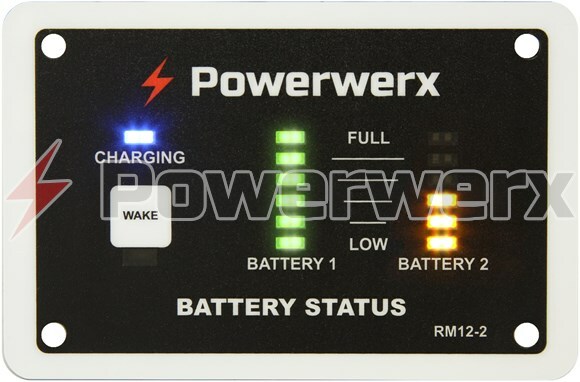 The Powerwerx RM12-2 is a 3-color LED Bar Graph Remote Meter/Monitor that displays battery charger and battery status. 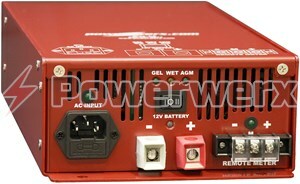 The RM12-2 can be used to monitor single or dual battery bank systems. The RM12-2 meter may be connected to the charger's DC output or directly to batteries. The RM12-2 may be used with most 12V battery chargers/systems including Kussmaul, Powerwerx EVC-45, Blue Sea P12 series chargers, NEWMAR 12V battery chargers. The RM12-2 is a direct replacement meter and upgrade for most emergency vehicle remote meters. This remote meter starts up in the test mode anytime power is applied. Both bar graph meters and the "Charger On" LED will rapidly flash for 5 seconds which test the meter. After the initial test the RM12-2 will display the current battery bank charge status. The RM12-2 will automatically go into a power saving sleep mode after 24 hours without a charging voltage present from a battery charger or alternator. During the sleep mode the remote meter will momentary flash every three seconds. The meter includes a front mounted "Wake" button. Pressing the "Wake" button will turn ON the remote meter and place it into the normal display mode for an additional 24 hours. In addition, any time the meter sees a charging voltage of 13.0 volts or higher, the meter automatically wakes up and switches to the normal operating display mode for the next 24 hours. The RM12-2 features Auto Bright Technology which will auto-adjust the meter’s display brightness to the surrounding ambient light level. For example, on a bright sunny day the LCD meter will auto adjust to its brightest level. Conversely, in a nighttime or dark environment, the LCD meter will auto dim to a lower light level so it is not to overwhelmingly bright during low light conditions. The RM-12-2 features 6 brightness display levels that are automatically adjusted based on the ambient light level from the meters built-in photo cell. Depending on your installation requirements, the RM-12-2 Remote Meter is very versatile and may be installed in a variety of locations. Make sure the battery charger is unplugged and off. Connect a wire from the Positive (+) Lead of Battery 1 to the “Battery 1” position on the meter’s terminal block. Optionally the Battery 1 and Battery 2 positions on the terminal block may be wired together to have both LED displays function simultaneously. 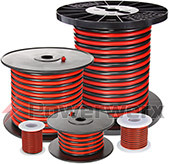 Ground connection: Connect a wire from either the chassis ground or the Negative (-) battery terminal to the (-) Ground position on the RM12-2 meter. LED charging indicator: Connect a 12V wire to the “(+) Charge” terminal to enable the Blue Charging indicator light. The Blue light will come on only when the unit is charging. 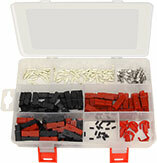 The RM12-2 meter Terminal Block accepts #22 - #16 AWG size wire. Connect a wire from the Positive (+) Lead of Battery 2 to the “Battery 2” position on the terminal block. Ground connection: Connect a wire from either the chassis ground or the Negative (-) battery terminal to the (-) Ground position on the RM-12-2 meter. If this meter is to be mounted in an exposed area, apply a small bead of silicone to the underside flange of the remote meter to reduce the chance of getting moisture behind the meter where the connection points are located. Mount the meter using (4) screws with (4) lock washers and (4) nuts (user supplied). Please see the included mounting template on page 4 for mounting your RM12-2 remote meter. For new installations, a printable mounting template can be found in the downloads section below, inside the RM12-2 User Manual.